He stayed calm as a cop dumped the contents of his backpack onto the sidewalk. Scenes like this had already played out with most of his friends. Today he was riding his skateboard to school, and running late, and now it was his turn to be the law's concern. He was made to take his shirt off to have photos taken of his tattoos. All the while he stood quietly, insisting that he wasn't in a gang, saying softly, "I don't belong to nobody," over and over, but when he saw the cop get angry and toss his skateboard out into the street, he ran after it, picked it up, and came right back to the questions. At 14, on that plank of wood and those wheels was the only place he felt good. "What gang are you in?" the officer asked Anthony Hem, a son of Cambodian immigrants. How many times would he have to say it? "I don't belong to nobody." Finally the officer went to his car, came out with a list of area gangs, and picked one near the top. "He just came up to me and said, 'Now you're on gang file. You're from this gang now, the Asian Boyz,'" Hem remembers. The Asian Boyz are affiliated with the Crips. From now on, that's how the law would see him. In a country where conversations about racial equality are focused heavily on African-Americans and Latinos, the Southeast Asian Resource Action Center (SEARAC) in Washington, DC, serves a different population. SEARAC supports grassroots organizations that are looking out for kids like Hem, children of refugees who face many of the same issues that other minority groups face, such as poverty, violence, prejudice, racial profiling, and despair. The national organization casts a close lens on state and national policies, and helps organizations like Khmer Girls and Boys in Action in Long Beach and the One Love Movement in San Diego relentlessly push lawmakers to reconsider policies like the one that put Hem on a gang file, with no notification to his parents, and with no due process to have his name removed. The policy knowledge that SEARAC shares serves as a tool that the smaller organizations integrate with their mentoring and cultural education. The collaboration helps foster young leaders who can speak for a refugee community still reeling from the effects of genocide and war. "These young men, they grow up in the same communities as the African-American and Latino men," said Jonathan Tran, SEARAC's California Policy and Programs Manager. "They face a lot of the same issues. And at the end of the day, the solution will overlap." 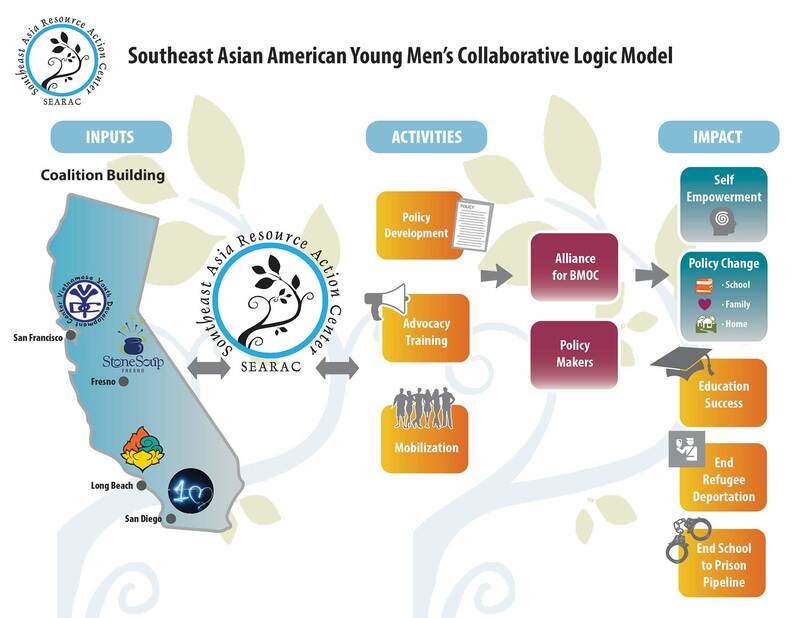 The policy knowledge that SEARAC shares serves as a tool that the smaller organizations integrate with their mentoring and cultural education. There is a national attitude that assumes Asian Americans do not need anyone's help, Tran said. But ignored within the stereotypes derived from images of affluent Chinese or Japanese immigrants and their often highly educated children is the reality of hundreds of thousands of children born in this country to refugees from Lao, Vietnam, and Cambodia. Their parents were almost all peasant farmers, and mostly uneducated. Those who suffered under Cambodia's Khmer Rouge in the years following the Vietnam War were forced into labor camps and faced mutilation and starvation. In some instances their lack of education kept them alive, as the Pol Pot regime (1975–79) was killing off anyone with a degree—even anyone who wore eyeglasses. In a country of roughly 8 million people, somewhere between 1.5 and 3 million were killed or starved to death and put in mass graves. Boats of refugees drifted in the South China Sea. Many of the rescued came to California. And they came to a land with a different language, and to mostly urban communities, where their farm skills were not needed. Tran says that while this is often the case with an immigrant, we as a country should take into account that for many Southeast Asian refugees, the past remains more challenging than the present. Post-traumatic stress disorder is the given diagnosis. For these refugees, their reality is repetitive emotional trauma—horrors relived every time a car backfires or the news shows a violent crime—and sudden anger, or a long and silent numbness. "It followed her," said Malachy Keo, whose Cambodian mother still suffers nightmares about the atrocities in her past. When he was 10 she was hospitalized, her heart weakened by stress and fatigue. As in many refugee households, a parent's trauma is often internalized in their kids, and Keo, who is 17, said he has battled depression for almost half his life. "All I thought about was, is my mom gonna be there when I get home from school?" he remembers. "We were always late on bills. We got help from the government but it wasn't enough and it got to the point where I thought about slinging [drugs]." Fortunately, Keo found out about Khmer Girls in Action, a center in the Cambodia Town section of Long Beach that has been helping young women through conversation, mentoring, and advocacy since 1998. The organization had just started a program for boys, the Young Men's Empowerment Project, and here Keo has begun to find his voice. Participating in group discussions called Restorative Justice Circles, he now speaks with a clarity that belies his age. "When I was depressed it made me think a lot, and as I started to think a lot, I figured out that there are some things in this world that are really bad, but the only way to do good in this world is to love," he said. "Anything bad you do is gonna have a big impact on your soul. But it's gonna have a good impact on you if you do good things. After that went through my mind, that's when I became my own role model." Founded in 1979, SEARAC fosters civic engagement by training nonprofits how to advocate for themselves. They provide the smaller organizations with up-to-date knowledge of ever-changing state and national laws so that the groups, and the young men they serve, can ensure their communities are more informed. That knowledge helps Andy Pacificar, a 53-year-old who served 20 years in a Washington State penitentiary, better mentor guys in San Diego through the One Love Movement. One Love's resources are very slim, but for Pacificar, the knowledge he gets from SEARAC is gold if it means the chance to inform a young man of his changing rights. Pacificar says it is a privilege to validate young men in their struggle, to encourage them to embrace aspects of their culture that their parents may have been too tired or too numb to teach, and to see a kid from the street go from being a risk to his community to being an advocate, even standing in front of state congressmen. "I can let them know where I'm from with firsthand experience, that the decisions you make now in a split second can change your life," said Pacificar, who was around when a drug deal went bad, saw his friend pull a trigger, and ended up with a felony murder charge. "It's not fun getting gray hair while you're locked up." "I don't claim that I can reach all of the youth, but the ones who are hungry, they'll listen." High on the list of challenges that these young men take to the Capitol in Sacramento is the issue of deportation. Once you are placed on a gang file, life is already tougher. Penalties for even the smallest misdemeanor offenses can carry longer sentencing. Routine traffic stops can last a couple of hours. But if you are on a gang file and were born in a refugee camp, say, in Thailand, or if you were over 18 when your refugee parents applied for US citizenship, a very small offense may mean you are sent back to a country you have never seen. Living in this reality, people here talk of a government deportation list as if they were living in a police state. Almost everyone seems to have a friend who was picked up, maybe for skateboarding with a beer in his hand, who is now back in Cambodia or Laos. They try to keep up on Facebook. Dara, a 29-year-old involved with One Love, has a brother, Maly, who has a nine-year-old daughter, and Maly is sure he's on the list. That's why Dara spends time at One Love. "I'm just trying to soak up as much knowledge as I can get," he said. The education that Pacificar and his staff pass on from SEARAC gives youth a sense of social involvement that can often foster a real sense of empowerment. Recently two guys from One Love, Rick Sek, 28, and Kevin Chuum, 19, opened a T-shirt line called Family Over Everything in the City Heights neighborhood in San Diego. They've taken an entrepreneurial approach to staying out of gang life, reading books like Rich Dad, Poor Dad, learning things they might not have gotten out of high school had they finished. They sell their merchandise to any race, any gang affiliation, and encourage guys like Sareth Sao, 19, to use their recording equipment to release his story through rhymes and beats. Sao, like so many others here, had his family broken up by deportation. His Cambodian household was always rough. His dad was an addict, and his mom was deaf. He says he was 10 when he and his friends started jumping people and selling drugs. "Whatever we had to do to eat," he said. One day his dad was arrested for not being up to date on his current address, Sao says. Then, soon after, Sao too was picked up for being out after curfew. He was 16 and was sent to a juvenile detention center. There he couldn't reach his mom, because she couldn't hear the phone ringing. He stayed two weeks longer than he was supposed to. When he got out, he learned that his father had been deported. Within a month, he had died of a stroke. "I'm trying to stay humble," said Sao, who was hanging out in the Family Over Everything shop on an afternoon in June. "I'm gonna get through it." When store hours end, Sek and Chuum take guys like Sao around. They get in Chuum's '83 Cadillac, listen to hip-hop, and drive out to the beach. They are urban, with the blood of rural peoples in their veins. They like the calm they feel out on the rocks, listening to the waters their parents crossed. They bait squid on hooks and pull lobsters out, and take them home to boil. I don't claim that I can reach all of the youth, but the ones who are hungry, they'll listen. As SEARAC continues to educate small nonprofits how to make themselves heard in government debates, they are really betting on the future of the young men and women for whom the organizations are a haven. A haven from the desperation of the streets, from the faceless trauma that permeates their homes. Seng So, a youth organizer with Khmer Girls in Action/Young Men's Empowerment Project (KGA/YMEP), recruits kids like Hem and Keo at the skate park near the 5,000-student Polytechnic High School. "These are the young men that are at the highest risk of dropping out or being pushed into the prison pipeline," he said. "I go in with a conscious effort to let my guard down." By leading Restorative Justice Circles, So helps to restructure a young man's idea of identity, making it broader, questioning what he has learned from the street, and teaching him to make himself relatable to the world. In a crowded part of California, where gangs are often a retreat into homogeny, a kid like Malachy Keo has used the Circles to learn another way to confront hate. Recently a Latino guy was making fun of him at school, but he stayed calm. "I said, 'Why are you hating on me? I've been through a lot, and I think I know what you've been through.'" Then he told him his story, of worrying about his mom, of not having a dad, of being hungry, and when he had finished, the bullying kid thanked him. Now they see each other in the halls, and they're cool. If SEARAC believes that the Southeast Asian population is seriously underrepresented at all levels of government, its hope is that by supporting local organizations like KGA/YMEP, guys like Keo will one day be a voice for his community. Seng So said Keo hardly spoke when he first came to KGA, and now there is a growing boldness and clarity to his speech. Remembering back before his adolescence, the silence of his home and his interior torment, Keo controls his indignant emotions and asks clear questions that someday someone will have to answer. "What if I did have those counselors helping me with my depression?" he says. "People say there are those resources, but where are they? They say the school counselor will help me, but do they have any pamphlets that say, 'If you're having depression, call this number?' Do they have something that tells you where to go if you don't have food? They really don't have that." "I can tell that I'm gonna make a change," Keo said. He has plans to join the Marines, then become a police officer. He hopes to advance a different approach to law enforcement, one where his buddy Anthony Hem won't have to worry about going out of the house to skate because his name's on a gang file. "KGA teaches how everything is structured through social status, race, and gender, and you shouldn't really fight it with violence. You should fight it with education. That's how we're gonna fix all this." KGA teaches how everything is structured through social status, race, and gender, and you shouldn't really fight it with violence. You should fight it with education. That's how we're gonna fix all this. What is the biggest misperception about the Southeast Asian community that you have to battle? 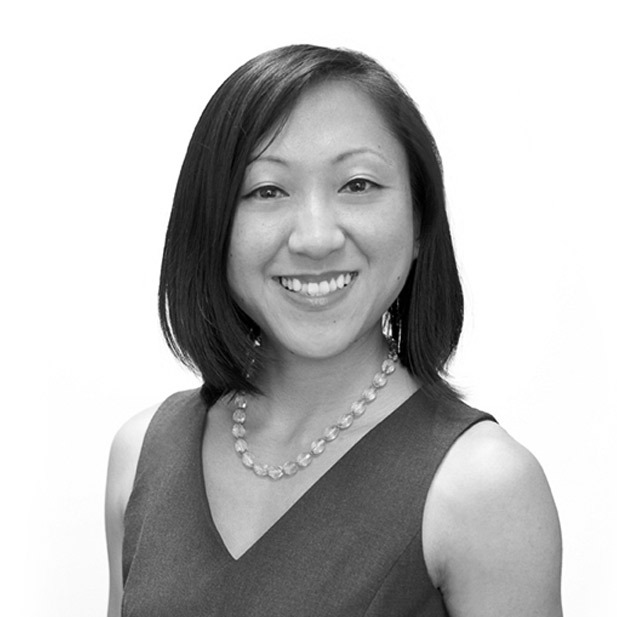 Often characterized as Asian American "model minorities," our communities are rarely acknowledged in the discussion of socioeconomic disparities among communities of color. The reality is that Southeast Asian American communities have grown from the largest refugee community to ever be resettled in US history. Since 1975, over 1 million refugees from Cambodian, Laos, and Vietnam have been resettled in the United States. Today, our communities number over 2.1 million nationwide. As communities from refugee and immigrant backgrounds, we share similar struggles with other communities of color, including poverty rates that are higher than the average US family, extreme challenges gaining English proficiency, and low rates of high school and college attainment. How does the intersection of the immigration and criminal justice systems affect the lives of the young men you work with? 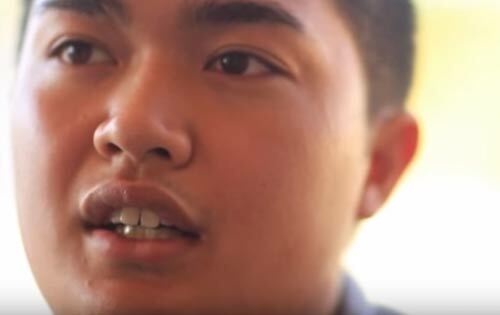 As refugees themselves, or as the children of refugees, Southeast Asian American young men have endured the trauma and challenges that come with escaping war-torn countries and genocide to immigrate to a country with racial and institutional barriers. These young men are subject to the same systematic marginalization as many other communities of color in the United States: failing schools, multigenerational poverty, racial profiling, over-policing, and mass incarceration. Yet for immigrant youth who have not naturalized, the school-to-prison pipeline may end in deportation and permanent family separation due to immigration laws that deport lawful permanent residents with any old criminal records, regardless of the unique facts of their cases. Individuals always serve their full criminal sentence before they are deported. How do you provide the young men you work with opportunities to lead? Our Southeast Asian American Young Men's Collaborative engage young men to be active agents of change in their communities. Together with leaders from Khmer Girls in Action (KGA), Stone Soup Fresno (SSF), and the Vietnamese Youth Development Center (VYDC), the Collaborative engages in strategic advocacy and organizing efforts. Youth participate by identifying community needs and solutions to improve conditions to help boys and men of color realize their full potential and remove barriers that perpetuate devastating disparities.